Mayoral candidate Jenny Motkaluk wants to spend half a billion dollars over the next six years to electrify and expand Winnipeg Transit's fleet. The Winnipeg business consultant pledged Tuesday to spend $581 million to purchase 190 additional buses — all of them electric — and replace existing diesel buses with electric vehicles. "Make no mistake, I am pro-transit," said Motkaluk, blaming declines on transit ridership on overcrowded buses, safety concerns, unreliability and routes that she said make no sense. "Efficient, reliable public transportation is a necessary part of a thriving city." Motkaluk says the federal government and the province would provide 75 per cent of the money for the new buses. She says she is not certain whether Winnipeg would cover its portion of the tab by borrowing cash, diverting funds from elsewhere in the city budget or raising transit fares. "We're going to take a hard look at the budget," she said, pledging to fully cost her platform by the end of the campaign. "For starters, we're going to divert the money that's already dedicated to additional [bus rapid transit] roadways." Motkaluk says she sees no contradiction in pledging to expand the transit fleet and her previous commitment to stop building dedicated bus corridors. She said the Southwest Transitway is "running through an empty field where there isn't any people, houses, schools and shops right now." The city hopes to see development along the transit corridor, which is in the process of being extended from Jubilee Avenue to the University of Manitoba's Fort Garry campus. "I don't believe that killing BRT [bus rapid transit] means killing infill development and killing density," she said, accusing incumbent Mayor Brian Bowman of discouraging densification by bringing in growth fees. 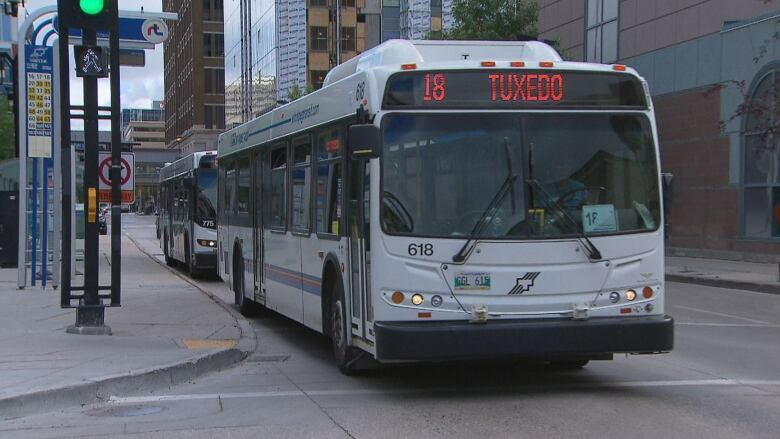 ​The union representing Winnipeg Transit workers opposes Motkaluk's plan to stop building bus corridors and doesn't like the idea the city must choose between conventional and rapid transit. "We've been saying for years that Transit needed more buses, as well as needing to transition toward an electric fleet," Amalgamated Transit Union Local 1505 president Aleem Chaudhary said in an emailed statement. "While it's good to see a candidate recognizing this, we also know that the best place for a charging station is on a rapid transit line. "For us, this is not an either or proposition. Any plan for better public transit must include a plan for finishing and expanding rapid transit." Bowman's campaign says in a statement that while the mayor supports electrification, it does not make sense to electrify the entire transit fleet in six years. "Half a billion dollars to switch out a just recently renewed bus fleet is a total waste of taxpayer money, is extremely risky, and is not an approach supported by industry experts, who recommend an initial deployment of only 12 to 20 electric buses," Bowman campaign spokesperson Kelly McCrae said in a statement. "Electrifying the city's bus fleet needs to be undertaken in a careful, phased in approach that respects taxpayers rather than handing them a half a billion dollar liability." McCrae noted the city is about to embark on a transit planning study. University of Manitoba city planning-department head Richard Milgrom says that while it makes sense to electrify some buses and add more buses, it makes no sense to abandon BRT, an amenity intended to reduce congestion and increase developmental density in the long term. "In general, there's a political lack of understanding to the importance of densification, everywhere," he said. Pedestrians on the Graham Avenue transit mall gave mixed reviews to Motkaluk's plan to add more buses by cancelling bus rapid transit. "I think it would create jobs," said Michal Kapeluch, who said he thinks it may be a good idea to get rid of rapid transit. "I don't use much of it and I think it was a big expense to begin with." Roy Desjarlais was less enthused. "We need more buses," said Desjarlais, surmising the transitway should not be cancelled. "I don't know about that part, because the university students and a lot of people use it."